Questions about TechWell/Software Quality Engineering? Casual, comfortable attire is recommended for speakers and attendees. In April, the weather typically ranges from the low 70s during the day to mid 50s at night (Fahrenheit). You may wish to bring a light jacket or sweater for the evenings or varying temperatures in the hotel. 5. What is TechWell/Software Quality Engineering’s cancellation policy? Registrations cancelled after Monday, March 23, 2015 are subject to a 20% cancellation fee. No cancellations or refunds may be made after Monday, March 30, 2015. Substitutions may be made at any time before the first day of the program. TechWell/Software Quality Engineering has attractive discount offers. Click here for the most up to date list of ways to save. Contact TechWell/Software Quality Engineering Client Support by phone at 888.268.8770 or 904.278.0524 or email [email protected]. Seating is limited in tutorials, so please reserve your seat early. As we get closer to the conference, some tutorials may be full. In this case you will receive an email asking you to make another selection. All tutorial selections must be made by Friday, April 10, 2015. The Wednesday and Thursday concurrent sessions do not require reservations. You may enter or leave any session at any time, space permitting. A laptop is not required for the conference, so the decision to bring a laptop is up to you. Some tutorials, however, do require laptops and are clearly designated on the tutorial description page. If you decide to bring a laptop for note taking or personal use, internet access may not be available in sessions or classrooms. Please note that TechWell/Software Quality Engineering does not provide storage or take responsibility for laptops or other personal items at the conference. 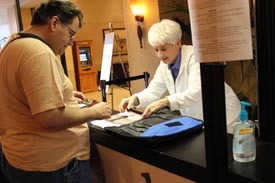 Once you arrive at the hotel, signs will be posted directing you to the conference registration desk. If you have any questions during the conference, feel free to ask a member of the Mobile Dev + Test Conference staff. 13. 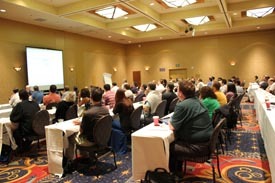 How can I arrange for the hotel at the Mobile Dev + Test Conference in San Diego? Take advantage of the conference rate at the Manchester Grand Hyatt in San Diego by booking your stay online or by calling 800.243.5732. Be sure to mention Mobile Dev + Test Conference to secure our special conference room rate. 14. Who is TechWell/Software Quality Engineering? 15. How can I contact TechWell/Software Quality Engineering? Contacting TechWell/Software Quality Engineering is easy. You can email us at [email protected], call us at 904.278.0524 or 888.268.8770, fax us at 904.278.4380, or reach us by mail at 340 Corporate Way, Suite 300, Orange Park, FL 32073.